As you make your plans for the upcoming weekend, make it a point to visit Hendricks County if you enjoy wine and live music, shopping, classic cars, a meteor shower or taking a walk, run or bike ride. We&apos;ve got it all going on during the weekend of Aug. 11-13. At the end of a long work week, how does sitting outside on a veranda to unwind, drink wine and listen to live music sound? You can do exactly that on Friday from 7 to 10 p.m. at Chateau Thomas Winery in Plainfield during their Music on the Veranda event. Don&apos;t worry about dinner that night, either. There are food trucks there beginning at 6:30 p.m. so that you can get some food in your belly before you start enjoying some fantastic Chateau Thomas wine. And since drinking and driving is never a good idea, you&apos;ll be pleased to know that the winery is conveniently located within walking distance of several nice Plainfield hotels. Indulge all you want, wash those work-week worries away, spend the night in a comfortable hotel, and you&apos;ll be ready to take advantage of the rest of this weekend&apos;s activities in Hendricks County. 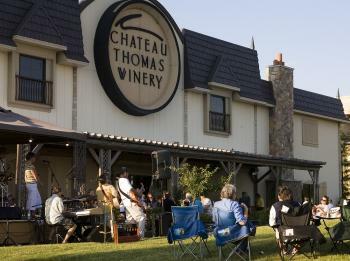 For more information about Chateau Thomas Winery, click here. Shoppers, you&apos;ll want to make your way to the historic Hendricks County Courthouse Square in Danville between 9 a.m. and 1 p.m. on Saturday for the Downtown Danville Sidewalk Sale. There are a bunch of really cool shops around the Courthouse Square that are joining forces for a back-to-school sidewalk sale, where you can find all sorts of unique clothing items, home decor, gifts, skin care products, maternity and children&apos;s apparel, jewelry and much more. If you&apos;re in the market for some fresh produce and other homemade items, you&apos;re in luck because the Danville Farmers Market is taking place on the Courthouse Square on the same date from 8 a.m. to noon. It&apos;s a shopping bonanza all in one place! For more information about the Downtown Danville Sidewalk Sale, check out the recent post by my fellow blogger Crystal Paschal by clicking here. You&apos;ve enjoyed Music on the Veranda on Friday night, and shopping on Saturday morning, so now what are you going to do? My suggestion is to head out to Coatesville for their free, family-friendly Classic Car Cruise-In on Saturday from 4 to 8 p.m. 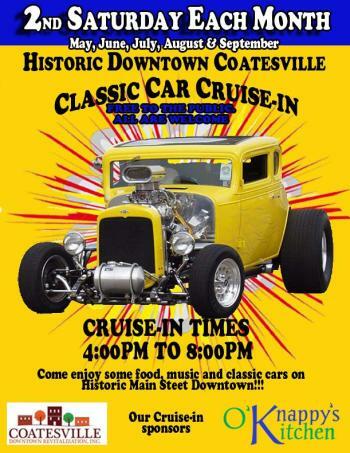 Checking out custom hot rods and classic cars is always a good time, and the Town of Coatesville will also provide live music to enjoy while you peruse the cars. Grab a bite to eat while you&apos;re there, and enjoy a fun evening with the whole family. From Coatesville, go straight up State Road 75 to McCloud Nature Park, right outside of North Salem, on Saturday at 9 p.m. for their Peak of Perseids program. The annual Perseids meteor shower peaks this year on Saturday, and McCloud Nature Park is a great place to view it, given its location away from light pollution. Park Naturalists will have telescopes available to use, or you can bring your own telescope. Be sure to dress for the weather, as the program is held outdoors. This program is free to attend and appropriate for all ages. If the weather is rainy or too cloudy on Saturday to view the meteor shower, the program will be cancelled, so watch for any weather-related news on Hendricks County Parks & Recreation&apos;s Facebook page. We have two prominent rail trails here in Hendricks County: the B&O Trail in Brownsburg and the Vandalia Trail that stretches from Amo, west through Coatesville, to the Hendricks-Putnam County line, where it then connects with the People Pathways and continues into Greencastle. Both rail trails have recently received major upgrades, which you can read about in more detail in my recent blog post by clicking here. Bikers, runners and walkers will be very interested in these two beautiful rail trails. Since writing that blog post, I&apos;m pleased to provide you some insider information -- the paving of the Vandalia Trail is now completed all the way into Amo from the county line. Hendricks County Parks & Recreation is still in the process of adding some nice amenities along the four-mile stretch of the Vandalia Trail that it operates, so there&apos;s still some construction equipment along the sides of the trail that you&apos;ll need to stay away from, but no one will mind if you want to explore the newly paved trail on foot or on bicycle. Completion of the Vandalia Trail upgrades is anticipated in November. Either trail can be enjoyed from dawn to dusk daily, and access to both trails is free, so get out there and get some fresh air and exercise! If you need even more ideas of things to do while you spend this weekend with us, be sure to check out the Visit Hendricks County Events Calendar. We look forward to seeing you this weekend!